In the 1970s, the Philadelphia Flyers had guys like Dave "The Hammer" Schultz, Bob "The Hound" Kelly and Andre "Moose" Dupont to not just beat opponents but beat them up, too. The current Flyers may still carry the "Bullies" nickname but they are hardly bullying anyone: They are one of only two teams in the NHL that has not been assessed a fighting major a quarter of the way through the season. "They're two different animals, the way the game is today," Kelly said. "With the rules today, you can't hit anybody, you can't verbally intimidate anybody, so that takes a lot out of it. You don't have to fight anybody. The biggest thing you're given is a face wash."
It's no secret that fighting has been weeded out of the game over the years, but nobody expected the Flyers to be on the leading edge of the anti-pugilistic trend. With tough players like Wayne Simmonds, Radko Gudas and Dale Weise, Philadelphia isn't exactly a group of shrinking violets. Even general manager Ron Hextall fought five times during his playing career and he was a goaltender. "We have a new mascot called Gritty now, and I think the Flyers' fans expect that from then players to play like Gritty because of the name he has," said Bullies-era defenceman Joe Watson, who believes the current team is more about finesse. "Fighting is a form of intimidation. ... Players think twice of going in the corner with this guy or that guy because they might get a punch in the face or hit severely or so on and so forth, and it just doesn't seem to happen right now. We do have guys that can handle themselves. I don't know why it has happened this way. It's hard to believe." "I think we're team tough," Weise said. "I don't think anyone takes advantage of us. I think if the situation arose, we've got a lot of guys that can handle themselves. But I just think the way hockey is going, you can't take a stupid penalty (if you) go and get an instigator or something like that or get a roughing and put (another) team on the power play." Philadelphia isn't a small team, with players averaging 6-1 and 198 pounds, but Jakub Voracek said: "I really cannot say that we are big and tough if we don't have a fight yet." "When you have a Wayne Simmonds on your team, I don't think people want to fight him and it's always good to have a guy like that who can play," said Coyotes coach Rick Tocchet, who holds the Flyers' all-time penalty minutes record with 1,815 and 171 fights during his career. "If there had to be a fight, he's a pretty good deterrent guy to have. I just don't think anybody wants to fight Wayne Simmonds. That's probably why there's no fights." 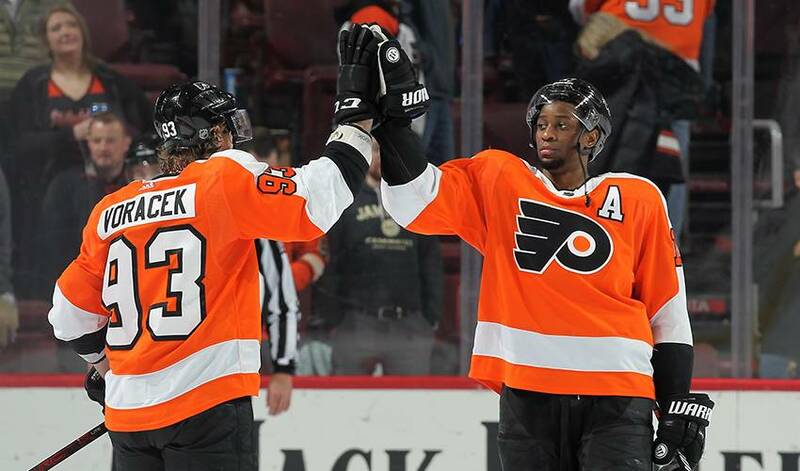 Simmonds and his teammates have tried to goad opponents into fights and a handful of times have dropped their gloves only to find no willing dance partner. According to HockeyFights.com, less than 16 per cent of games leaguewide this season have had a fight, down from 41 per cent as recently as 2009-10. "I don't feel there's any hate in the league anymore," said Kelly, who dropped the gloves 97 times in the NHL. "The rules have definitely changed the whole game, the whole approach and it's holding back a lot of the physicality that players used to play with. It's not worth the fight, and unfortunately you have to watch your teammate skate off hurt or something because somebody got cheap shot or did something and you just can't afford to want to jump in and help out." "The league's trying to take control of the head injuries, the hitting from behind, the cheap stuff, sticking a guy behind his knee," Tocchet said. "The NHL's trying to clean that up, so you don't need that deterrent of a guy going in there and policing (the game) himself. I still think that there's still a need for fighting in certain places ... The odd time a guy needs to be reminded that he can't do the stuff he's doing on the ice if things aren't being called."